French designer Benjamin Graindorge has designed a garden that floats on the surface of a fishtank and uses fish waste as fertiliser. The garden, developed with Duende Studio, serves as a natural filtering system, absorbing nitrate pollutants and meaning the tank's water does not need changing. Floating Garden, which is available to buy, will be on show at Forum Diffusion in Paris from 25 June to 25 July. Photos are by Ribon. See also our story about Local River by Mathieu Lehanneur for another example of this concept. The fish tank is a microcosm that reflects human concerns: within the finite space of its architecture the main issue that conditions the well-being of its inhabitants is waste management. 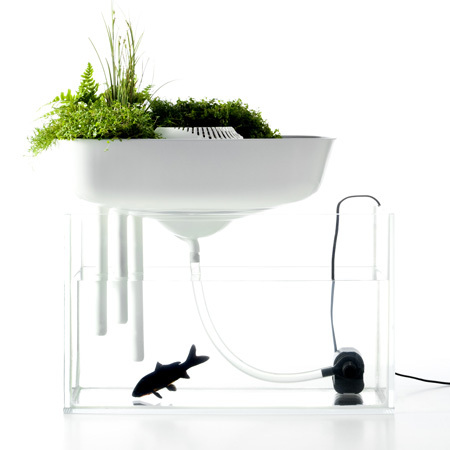 ‘Floating Garden’ by Benjamin Graindorge and Duende Studio brings an innovative solution to the daily maintenance constraints of freshwater aquariums with a filtering system that is 100% natural: a cushion of sand + plants that adapts to each and every model. Its recycling principle based on hydroponics does away with the chore of regular water changes and proposes a new domestic- scale typology, between the decorative glass vase and the water purifying plant. 1/ Gravel-bed filtration: tank water moves over a tray where it seeps thru a 5cm layer of river-sand. The sand bed traps suspended waste particles and forms a host environment for the aerobic and anaerobic bacteria that transform azote into nitrates. 2/ Aquaponics : nitrate-enriched water pours over a layer of plant-life. The substratum of roots extracts the nitrates to sustain plant growth, which means that water returning to the tank is pure. Needless to say, the vegetation is adapted to wet environments: e.g. Amazon-basin plants or tomatoes rather than cacti. The combination of these two techniques in a simple easy-to-use product marketed for the general public as of spring 2010 is a significant innovation. It is a little known fact that aquarium fish are up front in the domestic pets market. Aquarium water remains stable: it is clean and the tank needs only minimal upkeep: a sponge wipe over glass faces to remove algae deposits, an occasional top-up to compensate surface evaporation, and of course food for the fish. The prototype on show for sale at Forum Diffusion as of 25 June was developed thanks to an Audi Talents Award that Benjamin Graindorge won early this year. It gives concrete form to a ‘passion for waterworks’ shared by Benjamin Graindorge and Duende Studio. What with Graindorge’s ‘Domestic landscapes’ and the ’Local River’ project developed with Mathieu Lehanneur by Anthony van den Bossche, it only needed one step more (and a lot of experiments) for the principle to be turned into a commercially-viable product, realistic but full of poetic potential. Elegant design associated to extended function make ‘Floating Garden’ an object rich in paradox – thoughtful and forward-looking. Prototype available in a limited series of 10, each made to order by rapid prototyping process (3D print models). Every product is thus unique in its design. Comes with tinted aquarium glass. Prices on demand. Marketed in general public version in plastic and ceramic as of spring 2010.